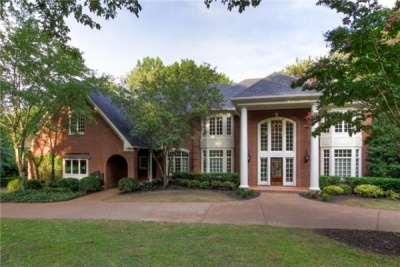 If you’ve been looking for a beautiful home in an established neighborhood, look no further than 918 Calloway Drive, located in the pristine Heathrow Hills subdivision in the heart of Brentwood. This six bedroom, six full bath remodeled home sits on one acre amongst private shaded trees and colorful Crepe Myrtles. It totals 7,878 square feet – including a full basement -and is priced at $1,195,000. One step inside the grand foyer of this gorgeous abode and you’ll immediately notice the updates and special touches that set this home apart from the rest. Unique features include custom designed light fixtures, new imported Italian marble floors, coffered ceilings and built-ins galore. You’ll also note it has space for everyone, with an overall seamless flow. Any chef would be proud to create in the fabulous kitchen, which boasts a sub-zero refrigerator, Viking cook top, brand new Bosch double ovens and dishwasher. Adjacent to the eat-in kitchen with its wall of windows is the cozy hearth room you’ve always dreamed of, with a wood burning fireplace and built-in bookshelves. The inviting family room includes a wet bar with refrigerator, another fireplace and French doors leading to your relaxing deck which overlooks the beautiful and private backyard, featuring a magnificent infinity pool, hot tub and large patio area. It’s an entertainer’s dream. The home is located just off Franklin Road, and only minutes from I-65. It’s zoned for Scales Elementary, Brentwood Middle and Brentwood High. For more information or to schedule a tour, call Erica Taylor with Reliant Realty today, (615) 859-7150. To view the full property listing, click here. If you would like to feature your listing in the Showcase Home of the Week, please contact Jodi Rall at jodi@franklinhomepage.com.